"We have hampered the oligarchic occupation of the democratic system, though we painfully burned our fingers. 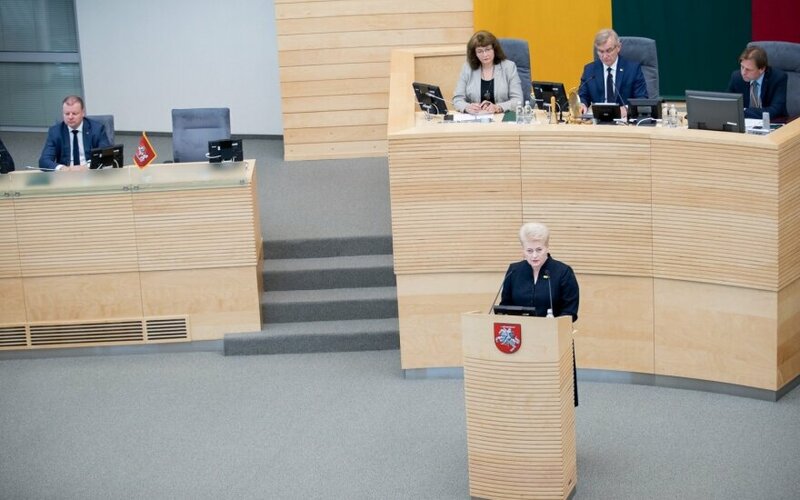 Me included," President D. Grybauskaitė said during her annual address on Tuesday in Seimas, LRT.lt writes. Furthermore, when talking about combatting corrupt links between business and politicians, the head of state lamented that matters did not proceed as fast as she expected and that reining in corruption took almost two terms, as well as law enforcement took so much time to move from suspicions to evidence needed for court proceedings. "We burn our fingers, when we misuse fire. We must realise that the president admits that she did something wrong. If you do things right, means you don't burn your fingers, but when you make a mistake, the fire punishes you. It is a peculiar, well put admission that she did something incorrectly," Mykolas Romeris University (MRU) docent, political scientist Vytautas Dumbliauskas told LRT.lt. According to the expert, D. Grybauskaitė appears to have reacted this way to the publication of her correspondence between her and former Liberal leader, accused of corruption, Eligijus Masiulis' correspondence. Furthermore, V. Dumbliauskas believes that after the "tulip mail" scandal, questions arose, whether in her interactions with E. Masiulis, D. Grybauskaitė may have known of the suspect activities of MG Baltic, thus D. Grybauskaitė had to make mention of this in her address, subtly admit she slipped up. "This supposed correspondence with E. Masiulis and later the president's ratings decline by almost 11% was already a signal that she got burned," the political scientist noted. "Through the correspondence (with E. Masiulis), she somewhat confessed that she knew about all this chaos. But what did she do? Nothing. In essence, she would speak about oligarchs, but her activities end up with bringing R. Karbauskis, the largest oligarch, to power. Such a paradox. By beating on the Social Democrats and Labourites, the president brought R. Karbauskis into government. A part of the Social Democrat and Labourite voters went to the "Farmers"," V. Dumbliauskas said. According to the MRU docent, D. Grybauskaitė likely admitted her mistake with future prospects in mind. It is whispered in political couloirs that the president could consider seeking a post in European Union structures following the end of her term. "Your term has ended and you do not know, what you will be in the future. If the European Commission does not invite her, D. Grybauskaitė may remain a pensioner in Lithuania. It would appear that she wishes to consider her name, when she departs her post, to be able to walk around with her head held high like Valdas Adamkus," V. Dumbliauskas suggested, why the president may have mentioned her potential mistake. Vytautas Magnus University professor, political scientist Algis Krupavičius agrees with V. Dumbliauskas that the president's admission that in combatting oligarchy she also burned her fingers is linked to the "tulip mail" scandal. "It is a certain admission that not everything was perfect in the Presidential Palace. But firstly this was regarding her relations with former Liberal leader E. Masiulis, the so-called "tulip mail" scandal," A. Krupavičius told LRT.lt. However, the political scientist disputed that the president actually made a subtle admission of any mistakes. According to A. Krupavičius, the head of state likely simply reacted to the scandal that arose and wanted to present herself as a victim of circumstance. "I believe that this is a reaction to public opinion, the MG Baltic scandal, the "tulip mail". This way it is telegraphing that the president is also not a saint in this situation. Nevertheless such an admission contains a footnote that the president is certainly not the most to blame, perhaps that she is even a sort of victim of circumstance. We can see efforts to excuse, what was done, that is that corruption and sale of influence is being combatted. The president's conclusion is that local "rubicons" and "gazproms" have been reined in. Thus the main message is likely different," the political scientist mused. According to A. Krupavičius, the president had to react to the "tulip mail" scandal because it resonated greatly with the public. "If the president made her speech otherwise, if she claimed that nothing happened, then the public, politicians and the news media would take it as an inadequate evaluation of reality and would say that the president has started talking with gods. Just because of this she had to be a little self-critical, to not be viewed as detached from her environment and reality," the VDU professor said. According to him, while the head of state could admit her slip up, it does not necessarily mean that she took of the mask of infallibility. "From a fickle and categorical head of state she evolved into a more moderate leader. If we are to look at the whole style and content of the annual addresses, we would see a gradual shift to a more diplomatic, less categorical president, but I certainly see no revolution in her behaviour," A. Krupavičius stated. Another commentator for LRT.lt, Klaipėda University docent, political scientist Saulius Šiliauskas stated that in her annual address D. Grybauskaitė appears to truly have wanted to express that together with all other institutions she sought to combat oligarchs, however not all means of combat met expectations. "The president, same as other politicians, is taking responsibility for the formation of oligarchic trends in democracy. However, other paragraphs in the annual address speak of her regret. I interpret it that the "burnt fingers" means that the proposed measures, legal measure were not as effective as hoped," S. Šiliauskas stated. According to the expert, this effort by the head of state to take responsibility regarding a not fully successful effort to combat oligarchic influences could be linked with the "Farmer" intentions to investigate the scandal of her and E. Masiulis' correspondence. According to S. Šiliauskas, by speaking of "burnt fingers", the president may have wanted to limit the majority's desire to analyse her actions. "This could be an effort to say that the president does not shun this responsibility. [...] Some could evaluate it as being an olive branch to the Seimas, perhaps that there is no more need for settling of accounts," he pointed out. According to S. Šiliauskas, the ninth annual address by D. Grybauskaitė was notable for her presenting herself not as above the political system, but as being within it. The political scientist finds this metamorphosis of D. Grybauskaitė to be an effort to change her image. "We see a sort of self-criticism by the president, though some may find deeper criticism and penance lacking, but this is the president's style. I believe that she needed to step over herself anyway, saying words like "getting burnt. This time the president's speech is not one of someone above the system, but one of someone within the system," S. Šiliauskas stated.